“KYOTO HANNARYZ” joined professional basketball league in Japan (bj league) from 09-10 season as a team based in Kyoto. Team jersey bears a big ARKRAY symbol on the chest. ARKRAY will provide solid support to “KYOTO HANNARYZ” in bj league and contribute to the development of sports culture in Kyoto. What is KYOTO HANNARYZ ? The name of “KYOTO HANNARYZ” comes from “Han-nari” a Kyoto dialect representing elegance, cheerfulness, and gorgeousness. The purpose of its activity is to widely spread the popularity of basketball in Kyoto and establish “new culture” where stadiums are full of spectators. 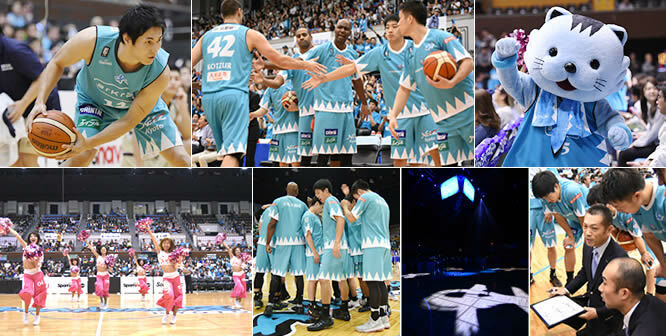 KYOTO HANNARYZ is committed with enthusiasm to glamorous cheering performance to liven up games just like NBA of the United States along with the acquisition of leading players to build on its strength as a team. Copyright© 2015 ARKRAY, Inc. All Rights Reserved.